Durring the Renaissance the Desert Tribe kidnapped young Jungle Tribe Nauceans and trained them in the ways of the assassin or Shadow Assassin of Au. They were used during the dark of night, unlike most desert tribe warriors. While the rest of the civilized world were begin to fight with gun powder the desert tribe was perfecting the art of shadow fighting. 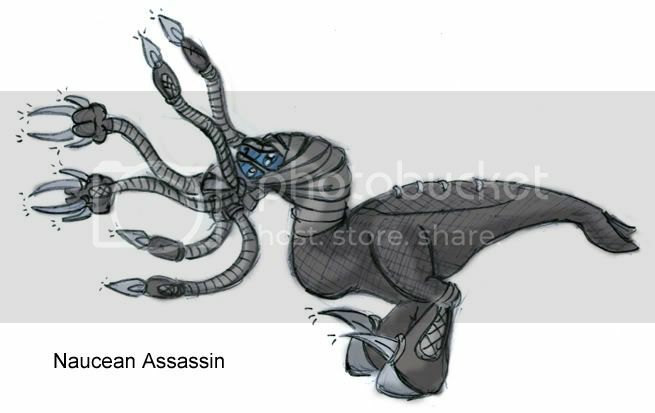 A Naucean Assassin could easily climb up anything and do acrobatic displays. They would wear an all black suit, black "floots" and wrap up any flesh with dark graycloth. The only parts that would show was the nostrils and 4 eyes. Even the pseudo mandible was wrapped up so when open you could not see flesh, even the beak was covered. On the floots were sharp talons in which they used for attacking enemies as well as help climbing up trees, walls and other such obstacles. On the oral tentacles with hands they wore bladed gloves and on the oral tentacles without they would wear punching daggers. They could use these to for attacking their enemies as well as climbing. Nauceans assassins were silent, fast, agile and disciplined. From the day they were put in training to the day they died they served the Blood Priests of Au. They believed their were holy warriors who's duty was to eliminate the non believers and infidels. Like the blood priests they would get back pericing in which would show out of small holes in the suit. The more piercing the more devout they were and higher ranking. The Naucean assassins were used up until the Emancipation Age were it was illegal to take such children. But a new group based upon the descendent's of their order sprung up. But these used guns and became the Shadow Snipers of Au. To this day it is said that they still hide in the shadows of the galaxy fighting for their religious cause. Only Jungle Nauceans that worship Au can be one and since that is a small minority little is known.But some say they wear nano suits in which can become invisible and have quantum based weaponry. Needless to say they have come a Naucean legend. I tryed to create a 3d Naucean. Promlems though with the neck. The leg muscles are a bit edgy and the spot around the eyes was something I didn´t want to waste my time on. I love the assasin! It's so stealthy looking! Oh, and nice job on the 3-d naucean too! damn you hydro! its so kinda-similar to the one i haven't even put up yet!! No, its just using Earth - English translation for what they are. Their real name is some unpronoucable squak and whale-like sound like all the other names i have given the Nauceans they are not the real names but Earth- English decriptions. Even the gods names are named after similar earth names becuse the real names would be too hard to say. Think of this as from a human perspective of the creature rather than it being from the Nauceans. Infact you could just as well call them Ninjas if you wanted to since neither is their real name. Thank you for this. it looks great! I am always happy to recive fanart, especially 3D ones like this. Perhaps Nauvorkean's most ironic creation is the Tormic, which was created simply for, as he claims, 'kicks and giggles'. At about two-feet tall, this mixture of torpal and omic is ferocious, but laughably weak. The next two creatures are possibly the most deadly Nauvorkean has ever imagined. The last creature has not yet actually been created, but complete plans for its development are nealy finished. Simply known for the time-being as the "Many-Beast", it is a mix of Torpal, Serlan, Fluffel, Necromonicon, and Anubian. It is expected to become the galaxy's greatest fighter. Ooh! I actually drew that as a creation of my evil scientist guy. He designed them to be fired out of cannons behind enemy lines as to cause incredible chaos and confusion. Baron-Doktor Voxk'gar calls dibs on the KORpal.